Mark Catlin has insisted Pompey won’t rush to replace the outgoing Dave Wright. The Blues’ head of youth recruitment is due to depart the club next month. He’s been headhunted by Brighton & Hove Albion to take up a similar role at the Premier League outfit. Wright is currently working his notice period after The News revealed he was to leave Fratton Park. 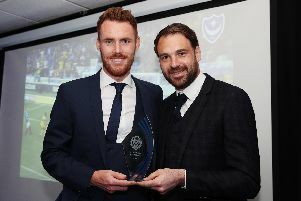 The former Pompey youth skipper only arrived back at his boyhood club in February – heralded a major coup at the time given his lofty reputation. Yet Wright is being taken to the Amex Stadium by Dan Ashworth following his link-up with the Seagulls – after acting as the FA’s technical director for the past five years. The Blues are in the process of finding a new candidate to take up Wright’s role, with the interview stage soon to be begin. But Catlin is adamant Pompey won’t act quickly if they don’t feel the right person is available. The chief executive said: ‘Dave’s role was relatively new when we brought him in. ‘It’s a role we had been missing, although we do see it as a key part of the club moving forward. ‘As with all things we do, we just wait to make a right appointment and Dave is still here until Christmas. ‘We’re in no rush. He continues to do a great job and we will wait until we get the right person. ‘Dave came in to be involved in a number of areas of youth development generally. ‘The recruitment structure is still there and we trust Dave, although recruitment isn’t actually everything that he does.